To implement the changes to the ADEA Credentialling Program as recommended by the Review of the ADEA Credentialling Program and subsequent ADEA Continuing Professional Development (CPD) Portfolio Pilot Project. Following the review of the ADEA Credentialling Program by Professor Trisha Dunning in 2010 and the subsequent CPD Portfolio Pilot Program in 2012-2013, a set of recommendations were made to the ADEA Board by the Credentialling Committee. The Board approved the recommendations which included the establishment of a subcommittee to devise an implementation plan and communication strategy. Consultation also occurred with the ADEA website developers and ADEA National Office staff to plan an on line credentialling platform. The results of the review and subsequent pilot program have given way to online processing of applications, payments, and the ADEA mentoring program, and to new-look templates for the annual submission of learning goals, CPD portfolio, and reflective/learning outcomes. Subcommittee meetings and consultation with website developers saw the planning of a gradual introduction of the changes to members and the planning of a communication strategy. Much consultation has occurred with various stakeholders since the initial review of the ADEA credentialling program in 2010. 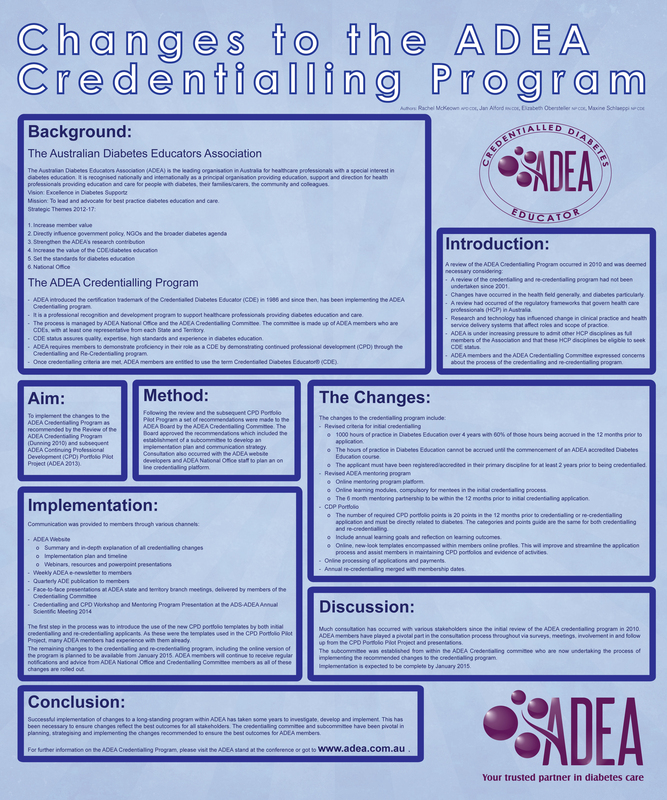 The subcommittee, established from members of the ADEA Credentialling committee, are now undertaking the process of successfully implementing the recommended changes to the credentialling program. Successful implementation of changes to a long-standing program within ADEA has taken some years to investigate and implement. This has been necessary to ensure changes reflect the best outcomes for all stakeholders. The credentialling committee and subcommittee have been pivotal in planning, strategising and implementing the changes recommended to ensure the best outcomes for ADEA members. The implementation is expected to be complete by January 2015. This poster award is supported by Roche.